Free rent and reduced pricing on select homes for a limited time! Please contact our leasing office to learn more at (512) 268-5483. Situated along a private street in Kyle, Texas, Aria Plum Creek is your peaceful oasis just minutes from downtown Austin! Aria Plum Creek is close to Plum Creek Golf Course, the Plum Creek Hike and Bike Path, and the Plum Creek Golf Trail. We’re also near Austin Community College and Seton Kyle. From our fantastic Kyle location near shops, restaurants, and entertainment to our beautifully designed apartment homes, Aria Plum Creek provides the perfect harmony to live your life. 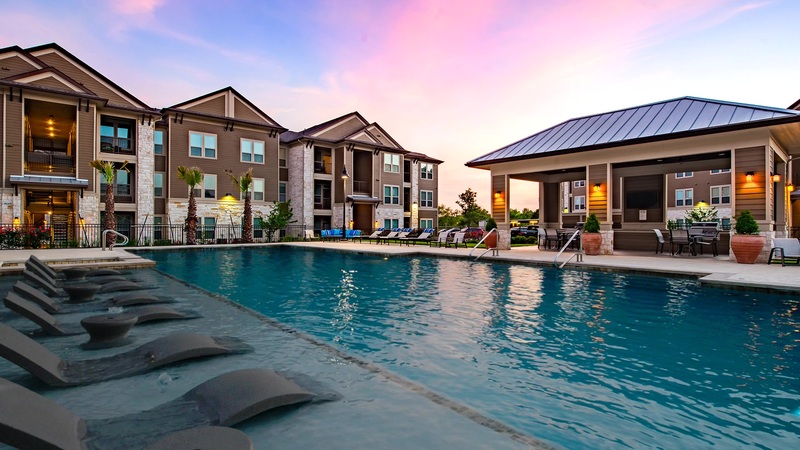 In addition to an ideal location, Aria Plum Creek is a luxurious apartment community with a resort-style swimming pool, a fitness center, and a dog park. Our apartments offer fantastic amenities, as well, such as private balconies/patios with storage, subway tile, granite countertops, and included washers and dryers. Aria Plum Creek is located off a private drive and is surrounded by open green space. Aria Plum Creek is a pet-friendly apartment community with a dog park. We also have a resort-style swimming pool and a fully-equipped fitness center. Your apartment will feature a beautiful kitchen with subway tile and granite countertops (kitchen and bathrooms), a private balcony or patio, and included washers and dryers. Call us today to discover our current leasing specials! Aria Plum Creek, in Kyle TX, brings you classic apartment living at its best! Call us today to schedule a tour. Looking for a pet friendly apartment community in Kyle, TX? Look no further than Aria Plum Creek! As one of the few pet friendly communities, we proudly allow cats and dogs here at Aria Plum Creek. Now your pet has the opportunity to relax by your side and enjoy the comforts of your apartment home. Pets upon approval. Maximum of two pets per apartment. Non-Refundable fee $300 for 1 pet, $500 for 2 pets. Additional $15 monthly pet rent per pet.